Dave, now that I’m back after a month on exercise in Wainwright I wanted to pass on a personal thank you. The family sign as well as the sponsorship for Camp Trillium were both wonderful and generous gestures. It was truly a pleasure working with you and who knows, maybe we’ll be needing your services again! In the meantime, you can definitely count on us for referrals! I could not have asked for a better way to buy my new home. David and his Team are very knowledgable and wonderful people to work with. Certainly the best real estate experience I’ve had. A fantastic experience — sold in four days and over asking! Experience really counts in real estate. David’s instincts and advice were spot on. Highly recommended! The expertise of Team Weir is beyond any expectations. We have dealt with Team Weir several times and have never been disappointed in their work ethics. I would recommend this team in a heartbeat. David and his Team were patient with us and never gave us a sense that they thought we were just lookers. Reaching out to David in the beginning was easy and even though we didn’t know each other he reached out to us and really took the time to listen to our situation and what we were looking for. His expertise was a great help when looking at homes. He not only pointed out what was right as well what was wrong with the home. Always letting us make the judgement call. He introduced us to Chelsea who brought her knowledge and sometimes a different perspective on the homes we looked at together . After many many months they found us the home we were looking for. Negotiations were handled professionally and quickly and we are so very happy to be where we are. Team Weir are leaders in their industry and we would highly recommend them to anyone searching for their new home. David is an awesome guy. He takes the time to explain important points about the area. He managed to help us find a house in just 1 week and give us great referrals for home inspectors and mortgage agents. There is a reason his team is on top; they know how to treat their clients. You will not be disappointed with Team Weir! Every dealing that I have had with Team Weir has been flawless. Their expertise, and professionalism is second to none. You won’t find a better agency that is more up to date on current market pricing or find anyone that knows all the pros and cons and is more familiar with all the surrounding areas. It’s no surprise to me that Team Weir continually out performs everyone year after year! Team Weir listened to what we wanted and sent us the info we needed even though we were living in the United States at the time. They were highly recommended to us by another family posted in the States and we were very impressed by the service we had. We would recommend Team Weir to any family that we know that would move to the area. Keep up the great work. We moved into our house 5 years ago and at that time we were very impressed with David and his team. Now 5 years later, we are extremely happy with our retirement home. He continues to give good advice and answers all kinds of questions about housing, decorating, land escaping etc. We highly recommend him!! Sold our previous in two weeks after we changed to David, with the previous broker having the listing for three months! Not only that, we also bought the home we wanted in the same time frame. Wonderful service, always there to answer your questions. The Team also provided a staging consultant at no cost, which in our case, greatly helped with our sale. Way to go Dave and Team!! I’ve had a long standing relationship with David and his company. As a satisfied customer, I can state without reservation that he and his Team work hard for both buyers and sellers and achieve top results. I’d have no problems using his services again and always recommend him to others looking to buy and/or sell. 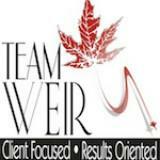 Team Weir is the only Real Estate agents that we will work with in the Quinte area. Knowledgeable, professional, effective, and thorough. David, being retired military, knows the ins and outs of the posting process and made our relocation enjoyable and stress-free. Always available, David and his team will make any home buying/selling experience a successful one. Thanks David! David and his team sold our home and sold us our new home! They are always available when needed! I always recommend this team! If any of my military friends and family are moving to the Trenton, Ontario region this year, you should get in touch with anyone on this team! They sold our house before the sign even went up!! They are very, very professional and I HIGHLY recommend them to look after your needs. David and Donna are ex-military and their children Kyle and Chelsea also work there, as well as many other qualified agents. From our own personal experience, you will be in GREAT HANDS with them! Fantastic team and will always use these agents and will recommend them to people we know. Thank you. We decided to use the services of David Weir as we were on a Government relocation and he was referred to us for his knowledge in this area. We found him to be very professional and dedicated to selling our home quickly. He knew all the extra paperwork that had to be completed for the relocation which made the process much easier for us. Even with a few bumps along the way in the negotiation process, he guided us and provided much needed support which helped us with our decision. David represented us very well and we would definitely recommend his services. I am impressed! Working with David Weir has been an overall great experience! Every turn he knew what he was talking about, gave good advice and was easy to contact and get answers. We made a military move from the States to Ontario so being available, organized, and listening to our needs was key, David succeeded in all of this. Then to top it off we just received all our documents on a memory stick. Nice touch! Well done Team Weir!! So glad to have you on our side. Thanks!! We decided to use the services of David Weir as we were on a Government relocation and he was referred to us for his knowledge in this area. We found him to be very professional and dedicated to selling our home quickly. He knew all the extra paperwork that had to be completed for the relocation which made the process much easier for us. Even with a few bumps along the way in the negotiation process, he guided us and provided us with much needed support which helped with our decision. David represented us very well and we would definitely recommend his services. ★★★★★ I am impressed! Working with David Weir has been an overall great experience! Every turn he knew what he was talking about, gave good advice and was easy to contact and get answers. We made a military move from the States to Ontario so being available, organized, and listening to our needs was key. David succeeded in all of this! Then, to top it off, we just received all our documents on a memory stick. Nice touch! Well done Team Weir. So glad to have you on our side. Thanks!! Through your generous donation, we have surpassed our goal and have raised over $34,000! The success of the eveining would not have been possible without people like you! Thank you so much for your support! We were super impressed with David and his team and when it comes time for us to sell this is the man we will be returning to. Thanks David for our first home buying experience t be so incredible and stree free. I bet we were one of the 'few' that the listing had not even gone up, had offers and sold before the listing and the sign even went up hein?!!! That was an awesome time - thanks for all you did as we left feeling so good. We even keep in touch with those who bought it from us - now that's what selling is all about!! Happiness all around!! David & his team are exceptional! He is very easy to work with & professional in helping us sell our 1st place & finding our forever home :) 5 years later and loving it! We were very pleased with the home stager and professional photographer that you sent in for us. The photos were awesome (I wish I saved the pictures for us to look back on) and I believe that they helped draw people to our house, which resulted with the quick sale that followed. David and Chelsea, thanks for helping make our stressful move easier. I just wanted to thank you for all the work you did in making my house purchase happen. Your flexibility and willingness to work at a distance made all the difference. Thanks for all the great referrals along the way. I'm very pleased with my new house and busy moving this weekend. Your bag with gift was a lovely touch for a house warming. I will have no hesitation in referring your services to friends or family. I sincerely hope that Spencer enjoys that home as much as we did. I'm sad to leave it but happy to know that, soon, we will be settled again into a space more suitably located for our family. Thanks for all your help!! And please thank your dad also for his confidence in taking on our home and knowing that he could help us make this happen. I've been telling anyone who asks about his process and how much I enjoyed working with you and the team. Thanks to you, David, Chelsea and all of Team Weir for being there when we couldn't be. You guys did such a great job. We wouldn't hesitate to recommend you to anyone wanting to buy or sell in the Brighton/Trenton/Belleville area. If we're ever in the area in the future we'll drop into the Trenton office to say hello. On behalf of Christine and myself I would like to take this opportunity to extend a heartfelt thanks to you and your team! I feel very strongly that Team David Weir did an outstanding job of promoting our house and setting us up for early success! Knowing that our house has a valid offer and is in the final process of being sold is a huge relief since we are anxious to move forward with our posting to Greenwood. You and your team provided us with constant, dedicated, professional support both evenings and weekends from the moment I called your office to arrange for a discussion regarding the sale of our house! We greatly appreciated you providing us with a solid list of contacts including but not limited to a Home Stager (Rhonda) and Professional Photographer (Warren), of which both services were included as part of your business. The result of a professionally-staged and photographed home is plainly obvious; our photos went public Saturday morning and a solid offer arrived that very same weekend! Both you and Robyn were very dedicated in responding to our questions and requests as soon as practical, and we greatly appreciated any and all subsequent follow-ups. The fact that we were very, very close in regard to list vs sale price was also definitely appreciated, in addition to the favorable position we enjoyed when negotiating the terms and conditions of our sale. I'm one of those people that tends to ramble on but I think I've hit on most of the key points regarding the sale of our home. Once again, please pass our sincere thanks to you, Robyn and the other folks on your team for a job tremendously well done! Best wishes for all that the future brings and I hope our paths cross again some day. David, just a note to let you know how much we appreciated your professional help in selling our house. Worked out perfectly! We really appreciated your time and advice! David, your help and support made the process of selling our house as painless as possible. Thanks again. Just wanted to take this opportunity to thank you for being so efficient, professional, and timely in the preparation of our house listing. We were both so impressed with the service and diligence. It has made us feel positive about selling our home again. Thanks much. Hi David. I just wanted to say thank you very much for the picture. We love it! We are going to get it framed and it will definitely be a nice reminder of our short time in Trenton. And, again, thank you for all your help and for selling our house so fast. If we ever know of anyone moving to the area, we will definitely send them your way. We just looked at the pictures and we are very impressed. Nicely done and thank you! I'm so glad that we called in the "A Team". I look forward to connecting with you properly to thank you and your Team in person. Thank you so much for your help & efforts to sell our house in a timely manner. Thank you so much for removing our stress & all the question marks that were surrounding us. All your help was greatly appreciated. That made our moving experience less stressful and more enjoyable. Thanks a lot!! Thanks for the news, Dave! We really appreciate all your work and input - we had complete confidence in your real-estate knowledge and abilities! You responded to our needs and concerns as if we were buying a 300k or 400k house, not just a modest 160k older home. Thanks for all the work from your staff as well - very professional and thorough...! David just called and told me we are the winners of this wonderful prize. First of all I want to thank you both very much. I really can't believe this yet. This is so exciting. The girls will be so excited. You do so much for your clients and for your community. Thanks again! David, we just heard the great news that the offer on our house has firmed up! Thank you all for your combined efforts. Please also thank Doug for his part in the offer negotiating. You folks really are the cream of the crop & have all the connections where they count! In the summer I was posted to 8 Wing Trenton. I initially came on a house hunting trip in May and met with David Weir. We had been in contact a month prior to my arrival via phone and email, searching the Trenton and Belleville housing market. David spent a considerable amount of time showing me homes. After three days of searching I finally made an offer on a house in Trenton. The offer was put forth but was not accepted by the owner. In July I returned to Trenton without having a place to stay and having all my furniture and effects in storage. The rush was on to find a home within a three week time period as allowed by the Royal LePage relocation people. After some time I did find another home and Dave wrote an offer. Of course Dave put all the safe guards into effect, making the offer subject to a house inspection, etc. The inspector found numerous defects in the home, knob and tube wiring, a damaged roof and rotting pipes in the basement. I have had previous renovation experience before but this was a lot of work. Dave and I got together again and put forth another offer. With much discussion with the seller Dave was able to secure an offer for $20,000.00 under the asking price, much to my delight. I commend Dave Weir for an outstanding job, in putting forth a successful offer and keeping it all together when things started to fall apart. On behalf of our family, I would like to sincerely thank you both for your professionalism and for a job very well done. In all our dealings, I was most impressed with your promptness, courtesy and sound advice. You both are true professionals in your field who I would highly recommend to all. Thank you for selling our father's house in a two day period and making it a pleasant experience in a difficult time for us. Bravo!! and best wishes for the holiday season. I would say that this letter is well overdue. We did not expect to be unpacking our boxes so soon. You just had to go out and sell our house in a week didn't you. Although the past two months have been very stressful and hectic, we are both relieved that the house is sold. We can now move forward and plan our next move to Germany. Everything seems to be falling into place. So, now we would like to thank you for your initiative and advice throughout the transaction. We probably would not have had such success had it not been for your knowledge of the market and the business. If we hear of anybody else wanting to sell a house, we would not hesitate to recommend you. Thanks again and good luck! Most of all, we sincerely appreciate the relevant, sound and honest advice you provided us. We always felt that you were being totally above board and truly working for us. Being first time home buyers, we needed the advice and strategy which you provided. We felt that we did indeed get the best home available and for the best price possible. We also appreciate the contacts you provided for miscellaneous home repairs. We received excellent service from them and are confident in their abilities. Also, we appreciate the little details such as when you arranged for the short notice home inspection. Denise and I are looking forward to moving to Trenton this summer and will gladly recommend you to others. Thanks again.